Peter, a 64-year-old former teacher, current school administrator, reflected on his forty-year career saying “I could not do as much as I had hoped because of the politics”. I commented on his tone by saying “you seem so sad”. Peter then said “you know, you have said that to me before and I have really thought about it, but I just don’t feel sad about it”. 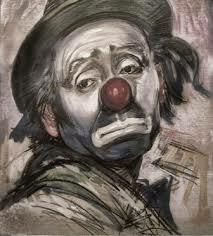 As Peter responded to my observation, I felt he was expressing even more sadness than in his opening statement. As a therapist, my job is to listen to content and tone at the same time. Sometimes, as in this vignette, I feel that the content and tone are synchronous. Other times, I have a strange sensation of feeling that the content and the tone are not matching up. In Peter’s case, I felt the tone and content to fall in line with each other, but Peter did not feel it that way. The tension between the content and tone reminds me of math. If we assume for a moment that the patient’s content is a constant, my perception of the patient’s tone is variable A and the patient’s perception of his tone is variable B. Sometimes I say A, the patient says B, and we puzzle over why we have different perceptions. Once in a while, I say A, the patient says B, but then I can see that I am off the mark, so I come around to seeing B. The reverse can also happen, where I say A, the patient says B, and in further discussion, the patient changes from B to A. Needless to say, the time course involved in discussing A and B is also highly variable. That is, sometimes this discussion happens in one session, sometimes this discourse occurs over many weeks, months or years. Thinking about tone, or more technically speaking, affect, is one of the most important parts of my job. One of my former professors taught me that affect was like weather in that it is the background to all that is said in a session. To put it another way, whereas Freud said that dreams are the royal road to the unconscious, I put forth that tone is that royal road as well. Tone allows me to peek into parts of the patient’s experience that he may or may not be aware of. The critic would say that perhaps I misread the tone and hence I falsely suggest to the patient that he is feeling something that he is not. That is a serious and important criticism; indeed, it is a hazard of my work. Having said that, discerning tone is a skill that I cherish; a skill that I have honed over many years. As Peter looks back over forty years of his professional life and feels disappointed, his grief is enormous. My theory is that the grand nature of this reflection causes him to split off the sadness from the ability to state his impressions of his career. To meld the content with the feelings is just too challenging now. I need to respect his need to split the content off from his feelings. At the same time, I need to point out that his feelings are being conveyed to me, even though he is not feeling them now. This is tricky business. If Peter is splitting off his feelings because he would be overwhelmed by them, then my pointing out to him that he seems sad as he is talking to me, could push him into a psychological space he is not ready to cope with. Once again, I need to be mindful that my words, however well meaning, could be harmful. On the other hand, a gentle push into merging his thoughts with his feelings could yield a more integrated and healthier mind. I have a narrow path. My patient Arthur tearfully told me the story of Dan Jansen. At the 1988 Winter Olympics, Jansen was a favorite for the 500 and 1000 meter speed skating races. However, in the early hours of the day of the race, he received a phone call saying that Jane, his sister, was dying of leukemia. Later that morning, she passed away. He fell in the race. A few days later, he fell again. In the 1992 Winter Olympics, he lost again. Finally, in 1994 he won the Olympic gold medal and he dedicated his medal to his late sister Jane. This is a story of triumph after adversity; this is a story of tenacity. For Arthur, this was a story of deep sibling love. As Arthur put it, in his family, if he died while his sister was competing in the olympics, the reaction would have been “there goes Arthur, making things difficult again.” I laughed, but I also knew it was not funny. Arthur wanted to mean something to his sister in the way that Jane seemed to mean to Dan Jansen. I thought about this later, realizing that I am unclear about why this matters so much to Arthur. What is it about his sibling that matters so much? I have read a great deal about why children of all ages, spend their lives trying to get love from their parents. This makes sense. The parents brought the child into the world. The parents were a touchstone for the developing child to feel good about himself. Mom and dad are responsible for building a child’s self-esteem. Yet, what is the role of the sibling in self-esteem development? Typically, siblings compete for attention from the parents, and hence there is built in conflict. Typically, the parents die first and the siblings are left, sometimes with close ties, sometimes not. I wonder why Arthur was so touched by Dan Jansen’s story. Was it that he could not perform knowing that he lost his sister? Was that he came back from adversity to triumph? Was it that in Arthur’s mind, Dan loved his sister in a way that Arthur will never experience, and somehow, that has a great deal of meaning for Arthur? I have questions, but no answers. I will continue to wonder. “Dr. Vollmer, you have no idea how hard it is for me to sit in front of you,” my patient Jane says. Jane is a 45-year-old woman who I have worked with intensively for 15 years. By intensively I mean that for ten of those fifteen years I saw her multiple times a week. Yet, despite our many hours together, each visit still brings up overwhelming anxiety. Fundamentally, Jane does not feel entitled to be part of the world. She is the youngest of four children, but her three older siblings were born close together. There is eight years between her and her next sibling. Her mom was profoundly depressed when Jane was born, since Jane’s maternal grandmother had passed away when Jane’s mom was pregnant with Jane. I have theorized that Jane is crippled with anxiety, partly for genetic reasons, partly because her parents never made her feel like an important part of her family. Jane always felt, and she still feels, like her family was burdened by her birth. This feeling of being a burden has spilled over into every other aspect of Jane’s life. That is, wherever Jane goes, she feels that other people do not like her. I want to help Jane. I have gone to many hours of supervision https://shirahvollmermd.wordpress.com/2010/02/18/supervision/, looking for new ways to work with Jane so she can feel more comfortable in my presence. Jane remains unbelievably anxious. At the same time, Jane and I both look forward to our time together. Jane reads my blogs, and like many of my folks, she finds them to be comforting for her. She appreciates looking into my thinking process in a way that helps her to feel connected to me in between our sessions. She looks forward to coming in and talking to me about my posts. I look forward to seeing her. Each visit I wonder how I can help her to feel comfortable in my presence so that we can go deeper into her dynamics. Years of working with Jane has taught me that I cannot take away her anxiety, not even her anxiety about our sessions. I need to tolerate her anxious and uncertain state. I need to tolerate that sometimes, more times than not, Jane cannot finish a sentence because she is too busy worrying what I am thinking. I used to try to fix that. Now, I accept it. I used to challenge her anxiety by asking her why she so firmly believes that I think negatively about her. Now, I realize that challenge is not helpful; it only makes her more anxious. I feel Jane’s anxiety. Jane appreciates that. It is a first step. Lisa felt that the only thing that could make her world “whole” again was for her parents to reconcile. Her parents love her deeply, but they are clear that they cannot live with each other. Lisa has to learn to accept her new reality of what feels to her to be a shaken world. Her parents are not going to change the reality, but they can learn to understand how their decision has changed Lisa. Lisa’s parents were admirable in their ability to hear Lisa, without getting defensive. Their tears spoke volumes about how deeply sad and helpless they felt. Both of them wanted to take Lisa’s pain away. Both of them knew they could not do that without an unbearable sacrifice to their own sense of themselves. They were torn, but at the same time, they were focused on how they could aid Lisa in her struggle to adjust to her new life. In this session, I felt that my role was to state the obvious. I did not tell Lisa or her parents anything they did not know before they walked into my office. Still, they needed to have an analogy, in this case, the foundation of a house, to grab on to Lisa’s vulnerability. They also needed to be reassured that understanding was an action. Listening to Lisa’s pain was hard, but necessary. They knew that, but they seemed to appreciate the gentle reminder. I fantasize that Lisa will grow up to be a psychotherapist. I was in awe at Lisa’s ability to state directly, to both her parents at the same time, how she was feeling. Although she was very sad, she also seemed hopeful that if they could understand her pain, she could plow through this experience. She also seemed to feel that if her parents got defensive, then she would feel worse. She took a big risk. Her courage was palpable. Eventually, she stopped crying. I think to myself that the combination of Lisa’s courage, her sensitivity and her eloquence are the essential ingredients for a mental health professional. Understanding is an action. That is a simple concept. Yet, as with Lisa’s parents, when the people who have to understand are also the people who caused the pain, understanding is a really hard action to take. My office provided an opportunity to take this really difficult, but necessary step. Although it is trite to say, in this case, a little help seemed to go a long way. I propose that blogging about psychotherapy is a useful therapeutic tool. It is useful both in the benefits it brings to my office practice, and it is useful in telling the public about the process of psychodynamic psychotherapy. Today, I want to focus on the utility of blogging to enhance the practice of psychodynamic psychotherapy. Surprisingly, my blog has changed the nature of my practice. In previous blogs, https://shirahvollmermd.wordpress.com/2010/02/20/confidentiality/, https://shirahvollmermd.wordpress.com/2010/01/24/retired-from-psychology-today-how-am-i-doing/ and https://shirahvollmermd.wordpress.com/2010/01/28/my-audience/, I have written extensively on my deep concerns that my blog could cause harm. Indeed, I continue to be mindful of the ill-effects of this exercise. At the same time, I have also discovered that my blog has deepened my relationships with my patients. The discipline of blogging, almost daily, has forced me to look at my work in a way that I have never done before. That is, I give myself the opportunity to take one particularly moving moment in my day and reflect on my reaction, my patient’s reaction and our interaction around that moment. When that patient returns I feel more connected. If the patient has read my blog, he does too. Whether we agree or disagree on my take of our interaction, the blog becomes a stimulus for discussion. Some might see it as an intrusion into the therapeutic process, but I have not found that to be the case. Rather, I have found that my blog has announced to my therapeutic community that I think about my patients when they are not in my presence. I thought this was obvious, and it may have been, but my blog has put my head space in the foreground. Even if a patient does not recognize himself in my blog, that I am thinking about a “patient” reminds my real patients that my head tilts towards thinking about them when they are not sitting in front of me. I used to think that patients should figure this out based on my responses to their struggles. Now, I think that since the psychotherapeutic relationship is challenging in that it is both a professional relationship and a personal relationship at the same time, my writing reinforces the personal aspects in a way that is surprisingly meaningful to the people I see. To put it another way, the internet, an impersonal tool, has created an avenue to make psychotherapy a more personal process. Blogging is a new frontier for psychotherapy. Last night, I watched the HBO documentary entitled “Temple Grandin” . http://www.hbo.com/movies/temple-grandin/video/trailer.html I was sad and touched to see her life story on the screen. At age two, Temple was diagnosed with brain damage. She did not speak. At four she began to talk. Although she was emotionally tortured in middle school and high school, she went on to get a bachelor’s degree in psychology from Franklin Pierce College, a master’s degree in animal science from Arizona State University and then a PhD in animal science from the University of Illinois at Urbana-Champagne. Grandin became well known after being described by Oliver Sacks in the title narrative of his book “An Anthropologist on Mars (1995); the title is derived from Grandin’s description of how she feels when she is trying to decipher subtle human emotion. http://www.oliversacks.com/books/anthropologist-on-mars/. Oliver Sacks, like the makers of the HBO film, deserve a lot of credit for bringing Temple Grandin’s life story into the public eye. One of the most disturbing parts of the film was when the psychiatrist in 1950, presumably after evaluating a four-year old Temple who had no expressive language, says coldly and firmly “Temple needs to be institutionalized.” The tears could not stop streaming down my face. How could the psychiatrist be so sure of himself? Why did he not describe what he saw as Temple’s strengths and weaknesses and then conclude that the family should wait and see how development progresses? Why did he not recommend language therapy to see if intervention could have an impact on Temple’s development? Why did he not understand that Temple’s mind was still expanding and as such, he could not predict the future? Sure, this scene, however accurately it was portrayed in the movie, was sixty years ago, but sixty years ago psychiatrists understood that a brain is not fully formed until adolescence. Once again, I took this doctor-patient interaction as sad evidence of the arrogance that I see so often in my profession. 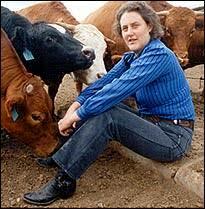 Temple Grandin describes herself as a primarily visual thinker and she has said that language is her second language. She describes most people as “neurotypical”. One of the most moving parts of the HBO film was the scene in which she made friends with her blind roommate. The roommate had developed extraordinary capacity to listen to her environment, while Temple had an extraordinary capacity to see her surroundings. They each understood each other because they could both relate to having a sensory capacity which far exceeds the neurotypical person, while at the same time having other sensory capacities which were absent. Although the scene in which they begin to understand each other is so touching, I felt enormous sadness. Most neurotypical folks need to be around other neurotypical people. In the face of different brains, or different skin colors, or different religious beliefs, people, especially adolescents, get very mean. For example, Temple often repeated herself, to which her high school colleagues would say “tape recorder”. I felt this cruelty to be both crushing and unbelievably common. Many of my patients are “neuroatypical”. I really like that word. It means that they have brains which are outside of the bell of the bell curve. These clients know, like Temple Grandin knows, what it feels like to have only a few people who can relate to their brain. This isolation is devastating and long-lasting. The way I see it, these neuroatypical people are like any other minority group in that society needs to have respect, tolerance and acceptance of difference. How a society takes care of their minority groups says a lot about the culture’s moral fiber. Sometimes, quite painfully, psychiatrists have a role in this victimization. Any one of us can be targeted for being different. Temple Grandin’s story is a good reminder. Carl, the subject of https://shirahvollmermd.wordpress.com/2010/02/05/injecting-the-dye/ came in the other day explaining an unusual situation in his life. As he was talking, I went into a reverie. I asked Carl to repeat the story. In the repetition, the story was understandable and clear. I began to wonder why I did not understand the story the first time. Was I having a focusing problem? I wondered out loud. Was Carl being vague? I was not sure. In discussing this dilemma with Carl, we clarified that Carl was free associating to his story in such a way as to make it incoherent. Carl was reporting the series of events as if it were a dream in which connecting statements do not exist. Some people think that psychotherapy is about free association, meaning that the person should say what comes to his mind, whether it makes sense. I have called this phenomena “right brain hypertrophy” where the creative side of the brain overrules the logical, linear part of the brain. Although some psychotherapists might encourage this verbal interchange, I find that there needs to be a top-down model to the brain. The story needs to make sense. It needs to follow a logical progression of events. After the details unfold, then my patient and I can wrestle with the ideas and associations which come to mind. Without the initial structure to a story, it is hard, at least for me, to dig into the meanings. Some patients are what I call “too left-brained”. They do not experience feelings, or associations, or ideas about their interactions in the world. As such, it is hard to have a canvas to create an inner world of motivation. Others, are “too right-brained” in that following along on their train of thought can be challenging such that it is hard to feel like we are working together. 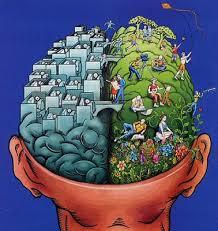 The large right-brain folks can sometimes make me feel isolated in that I feel we are in two silos. The large left-brain folks make me feel like we are about to get into the sandbox, but there is a great deal of hesitancy. 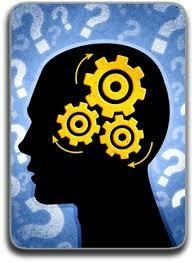 My job as a psychotherapist is to take a patient where he is at, and help him develop. For my large right brain folks, I want to help them be a little, but not a lot, more linear in their thinking. For my large left-brain folks, I want them to feel comfortable talking about ideas which may or may not make sense. Dividing the world into two categories of people is always fun. Of course, people are more complicated than that, but thinking about left and right brain is one way to understand why people have such different struggles in their world. Supervision is a word used to describe the “teaching” of psychotherapy. Psychiatrists, psychotherapists and psychoanalytic trainees all go to supervision as part of their training. Supervision, like so many aspects of my field, is a vague notion. The student sits down with a supervisor for one forty-five minute session a week and they discuss cases. Most of the time it is a free association festival. That is, the trainee starts talking about a case, the supervisor chimes in when he thinks he has something valuable to say, and then the ball goes back and forth until the forty-five minute hour is up. The value of that time together is, of course, hard to say. I am in the middle of my career. I have been in private practice for twenty years, and I had five years of psychiatric training before that. In my early years of practice, I entered into psychoanalytic training, an eight year odyssey which included two-hundred hours of supervision, divided over four supervisors. Upon finishing my psychoanalytic training in 2001, I then elected to go for supervision to help me with some of my more challenging clinical situations. All of these supervisors have been male, all substantially older than I am, and each one, offering me a unique perspective on my field. The benefits of these hours in supervision are not tangible, but I have almost always enjoyed the process. I am stimulated by the conversation, and I am challenged to think in new ways. For the past ten years, I have supervised child psychiatry fellows. I think, although I am never sure, that I have helped my students develop clinical acumen. I also believe that I am offering them a perspective on the field which full-time academic child psychiatrists do not bring to the table. That is, being a child psychiatrist, struggling to help children and their families, is a very different career path than an academic child psychiatrist who is trying to break new ground in the field. Yet, once again, the value of my supervision is hard to quantify. In all my years of practice, I have been to one day-long conference on how to be a supervisor. I felt the day was a major waste of time. Supervision is not psychotherapy, the lecturers told us. I knew that. There are still boundaries and confidentiality issues. I knew that too. There are also liability issues. The supervisor assumes liability for the patient that the trainee is taking care of. “Yep,” I thought. What was shockingly missing from that conference was tips on how to be a good supervisor. Teaching psychotherapy is an art, with few guidelines. I appreciate the art, but a few guidelines would be nice. Supervision parallels psychotherapy. The trainee is almost always anxious presenting his work. The supervisor is on the spot to say something meaningful and intelligent. When the trainee appreciates the words of the supervisor, both parties begin to relax. A process has started. There is hope. The stakes are lower than in psychotherapy, but they are still high. That is, the trainee is exposing himself when he describes his thought process. The supervisor is also exposed when he responds, ideally, in a tactful, thoughtful and sensitive way. Vulnerability is part and parcel of my field. Supervising, and being supervised, is part of that vulnerability. The struggle is there; mostly, the rewards justify the effort.